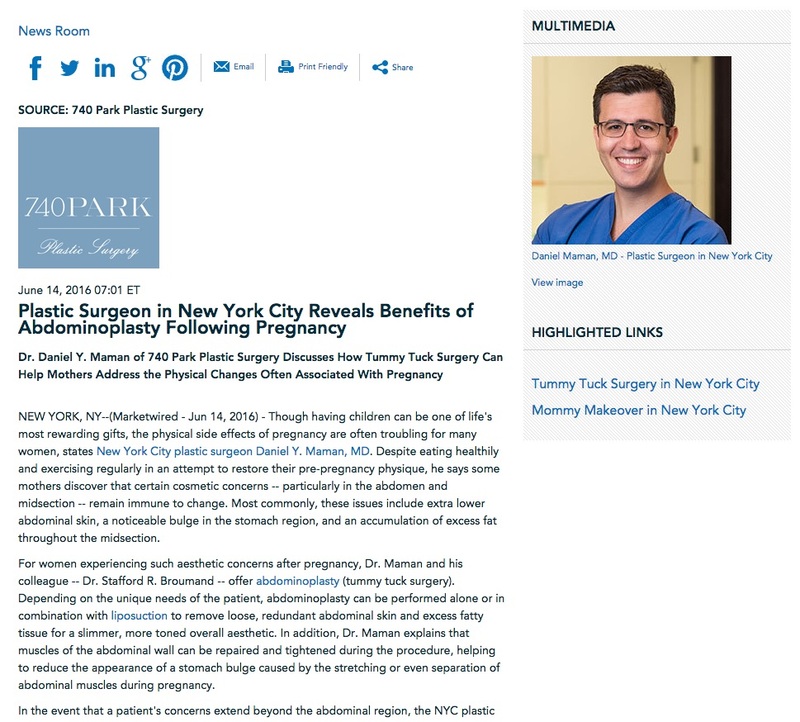 Dr. Daniel Y. Maman of 740 Park Plastic Surgery discusses how tummy tuck surgery can help mothers address the physical changes often associated with pregnancy. 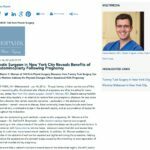 New York, NY — Though having children can be one of life’s most rewarding gifts, the physical side effects of pregnancy are often troubling for many women, states New York City plastic surgeon Daniel Y. Maman, MD. Despite eating healthily and exercising regularly in an attempt to restore their pre-pregnancy physique, he says some mothers discover that certain cosmetic concerns – particularly in the abdomen and midsection – remain immune to change. Most commonly, these issues include extra lower abdominal skin, a noticeable bulge in the stomach region, and an accumulation of excess fat throughout the midsection. For women experiencing such aesthetic concerns after pregnancy, Dr. Maman and his colleague – Dr. Stafford R. Broumand – offer abdominoplasty (tummy tuck surgery). Depending on the unique needs of the patient, abdominoplasty can be performed alone or in combination with liposuction to remove loose, redundant abdominal skin and excess fatty tissue for a slimmer, more toned overall aesthetic. In addition, Dr. Maman explains that muscles of the abdominal wall can be repaired and tightened during the procedure, helping to reduce the appearance of a stomach bulge caused by the stretching or even separation of abdominal muscles during pregnancy. In the event that a patient’s concerns extend beyond the abdominal region, the NYC plastic surgeon notes that a number of complementary procedures can also be conducted in conjunction with tummy tuck surgery to formulate a mommy makeover. More often than not, he says these additional treatments focus on the appearance of the breasts and typically include breast augmentation, breast lift, or a combination of both. Ultimately, Dr. Maman states that while abdominoplasty can be an excellent option for numerous women seeking to regain their pre-pregnancy figure, every woman’s body reacts differently to pregnancy. For this reason, he encourages anyone interested in cosmetic surgery following pregnancy to consult with a board certified plastic surgeon in order to identify – and eventually receive – the most appropriate aesthetic treatment(s) for her unique needs and desires. Certified by the American Board of Plastic Surgery, Dr. Maman is a Harvard-trained plastic surgeon in the Manhattan area. After obtaining his medical degree from the Mount Sinai School of Medicine, he completed his plastic surgery residency at Mount Sinai Hospital and subsequently underwent additional Fellowship training at the Massachusetts General Hospital / Harvard Medical School. Dr. Maman remains active in several prestigious medical organizations, and he is committed to giving back to the community through his involvement in charity breast cancer clinics and surgical mission trips. Distinguished as a leader in the field of aesthetics, he has been named a “Rising Star in Plastic Surgery” by The New York Times. To learn more, visit plasticsurgeonsnyc.com and facebook.com/740ParkPlasticSurgery. Dr. Maman is available for interview upon request.